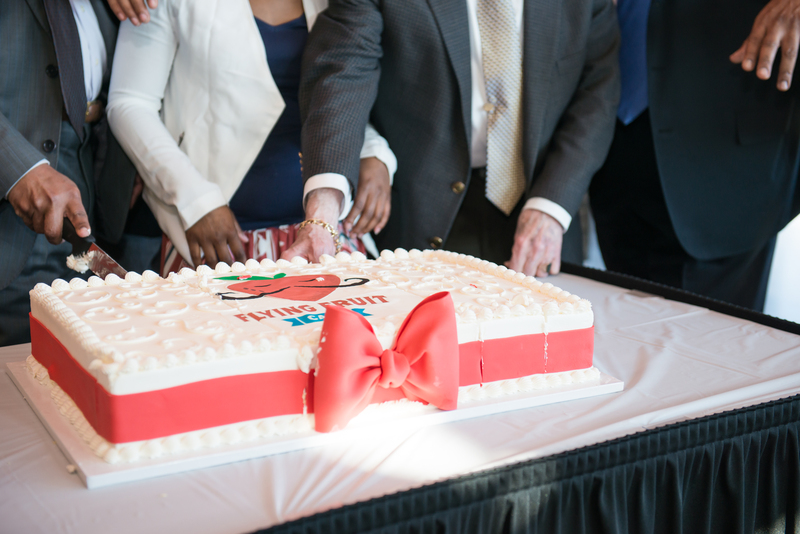 Two university presidents and Baltimore city youth joined hands to cut a cake bedecked in a giant red ribbon celebrating the grand opening of the city’s first Flying Fruit Cafe. The cafe is part of a job training program out of The Choice Program at UMBC that serves 200 local youth each year. Located on the sixth floor of the University of Baltimore (UB) John and Frances Angelos Law Center, it offers year-round job training and employment skills development for Baltimore area youth, with coaching, mentoring, and structured engagement activities provided by AmeriCorps members, all based in a vibrant university environment. UMBC President Freeman Hrabowski and University of Baltimore President Kurt Schmoke presented remarks during the ribbon cutting ceremony held on February 18, 2016. AmeriCorps Opportunity Youth Matt Smith and Daesha Johnson shared their personal experiences with The Choice Program and the profound impact it has had on their lives. Daesha described how the Choice Program provided a support network for her as she worked toward completing her high school diploma and helped put her on a path toward college and a career in nursing. “Choice gave me that support…by allowing me to have the opportunity to be a leader among my peers and awareness of being a good example,” shared Daesha. Matt explained how the Choice Jobs Program helped him confront and overcome challenges, and realize his potential. The Choice Program currently operates a Flying Fruit smoothie stand at Camden Yards during the baseball season and a Flying Fruit kiosk at the Inner Harbor behind the Maryland Science Center from April to October. The Choice Program at UMBC is a nationally recognized model for community-based intervention that has served more than 20,000 youth and their families from Maryland’s highest risk communities for more than 27 years. Fifty AmeriCorps Community Service-Learning Fellows provide critical contact, mentoring, and advocacy to young people involved in the juvenile justice and social services systems. The program’s partnership with the Maryland Department of Juvenile Services (DJS) extends for more than 25 years. Focus areas of intervention include education, employment, family involvement, and community supervision. The program works within high poverty communities to reduce external obstacles to youth and family success. Last year, 92% of participating youth completed the program and were not adjudicated with new charges. Images: Dawn Kirstaetter, Baltimore deputy mayor; President Hrabowski; Matt Smith; Daesha Johnson; LaMar Davis; UB President Kurt Schmoke. Official ribbon cutting of cafe. Photos by Marlayna Demond ’11 for UMBC.